There are times when being a music fan can be extremely stressful… agonizing even. Let’s face it, loving music is an inherently uneven proposition to begin with. You are of course merely an observer, a customer when you get right down to it, but once you commit to being a fan then buying records is no longer is just a modest financial investment, something that you might play a few times when you first get it home but soon will be set aside and forgotten. Instead it becomes almost an emotional investment that has all sorts of underlying meaning that often has more to do with YOU and your worldview than the actual records themselves. Unlike other investments where you’re usually satisfied to simply get your money’s worth out of your purchase, with music you are hoping for, indeed sometimes expecting, a life-altering experience for your 79 cents that was then the going rate for what was on average maybe a three minute song. With these heightened expectations comes the likelihood of greater disappointment and the stronger your allegiance to a particular style or a specific artist the more at risk you are of being almost personally wounded by a notable slip in their output. Your own identity becomes wrapped up in the creative inspiration of those theoretically unconnected to you and as a result their successes – and failures – in a way become your own. When they hit their mark and attract wider notice the pride you feel is palpable because now in a way they seem to almost speak for you to the world at large, expressing your shared cultural perspectives in a way you have neither the voice nor the means to have heard. Yet your support of them is what amplifies their voice and elevates their platform in the first place. As such the artist needs to keep your interests in mind when they approach their next record, yet the creative decisions themselves are out of the fan’s realm entirely. So the audience waits, eternally powerless, for each new release, hoping it will not just meet their expectations but surpass them. Yet all the while they nervously brace themselves for the let down they hope never comes. They can’t let on they have their doubts however. A true fan after all only gets to share in that glory if they never waver in their assurance that the glory is inevitable and thus each music fan takes on an air of confident bravado, certain their idols can do no wrong… until of course they do. Because they ALL do… eventually. As 1947 came to a close The Ravens were arguably the most vulnerable of all rock acts to fall prey to this fate and let down their fans. For starters they were the ones with the most verifiable success to date, as Write Me A Letter was climbing the rankings of best sellers as we speak, cracking the scant ten spot listing in Billboard’s Race Charts as the New Year dawned, the first rock release to break through and gain official recognition in that regard. That meant expectations would be higher and thus they’d have further to fall should they take an unfortunate misstep. But they also were at risk due to their makeup. Unlike many of the other nascent rock styles which were alien sounding to much of which came before it, there was precedent in the vocal group realm for mainstream appeal, provided of course you adhered to the pop sensibilities of the day. The Ink Spots had made their career out of that approach and though it has the appearance today of selling out, of bleaching their blackness away to appeal to a race-averse establishment, they’d still done what few other black artists dared dream and became verifiable stars across the entire cultural spectrum making it an alluring enticement for others to follow in those same footsteps. Which is precisely what The Ravens did. Last month The Ravens released as their official follow-up to “Letter” the two-sided pure pop drivel of Searching For Love b/w For You, in the process turning their backs on rock ‘n’ roll, lock, stock and barrel it would appear. The first featured Maithe Marshall’s fragile tenor trying to out Ink Spots the Ink Spots while the flip offered the usually infallible bass voice of Jimmy Ricks being toned down to appeal to a supper club audience. Though both were well sung at a technical level, they were sung in a style meant to appeal to an entirely different and more well heeled audience. 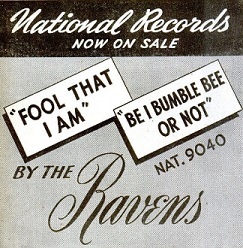 Whether getting immediate negative feedback, or more likely knowing that the other record was a reach outside their normal fan base, The Ravens immediately released Be I Bumblebee Or Not on its heels the first week of January, a rock record through and through. If nothing else it would serve as a reassuring olive branch to the fans whose support had gotten them this far to begin with that they weren’t being entirely forsaken. But as would always be the case with The Ravens, even when aiming at the right target they had to be careful with what arrow they chose from the quiver. In Jimmy Ricks they certainly had their most potent weapon, a subterranean bass voice that was as unique as it was distinctive and who would always provide the group with an immediately identifiable calling card. Yet Marshall’s high voice offered them another texture to mine, even though they were already turning to him most often to bridge the road towards more pop territory. The others in the group were no slouches in the vocal department either however and whereas many other groups saw their morale suffer when a powerhouse lead or charismatic frontman commanded all of the spotlight, The Ravens wisely let some of that spotlight shine on the others which made for a much happier group I’m sure, not to mention a much more diverse sound, which is precisely what makes this record stand out so much and turns those fears of stylistic abandonment into rapturous joy that they not only met your expectations, but quite possibly surpassed them in the process. Recipient of that altruistic policy here on the inventively titled Be I Bumblebee Or Not was Leonard “Zeke” Puzey, the group’s second tenor. As opposed to Marshall’s first tenor, which sounds fragile and angelic as it soars higher and higher in the atmosphere, Puzey sounds earthbound and vulnerable by contrast. With lyrics designed to highlight this aural persona he’s offered up as a dreamer, hopelessly love struck and privately hoping for the object of his desire to return his interest. You get the sense almost from listening to the way Puzey conveys his feelings that he’s the kind to write poetry behind the closed doors of his heart but is too shy to share it with the one he wrote it for. He sells these lyrics as if they came from his soul and were never spoken aloud before he committed them to record. The mid-paced tempo straddles the line between ballad and something that jumps, making it instantly catchy and the type of thing that will stick in your head the rest of the day. A spry guitar makes an unexpected but welcome appearance and the other Ravens “Buzz-buzzing” in the background gives it a different sort of rhythmic bed to float on, the combination of which is absolutely captivating. The full group harmonizing on the first bridge is astonishingly good, ending with Ricks delivering one of his patented deep-toned responsorial lines to close that section before Puzey picks up the song unadorned again. At this point you’re thinking this record is going to be perfect. Everything is gelling, the right song, the right group, the right arrangement at the right time in history, just as rock music as a whole is consolidating their hold on the growing audience. We might even see our first 10 on Spontaneous Lunacy! Pity Jimmy Ricks has to barge in and spoil it. Well not quite spoil it… but here’s where they sell themselves and their audience short. You KNEW Ricks was going to get the spotlight swung back around to him at some point. You’re fully expecting it in fact, so you know it’s just a matter of time before he puts his distinctive stamp on the record. Their choices thus far on the song have been impeccable however, not just in terms of what they chose to feature but also what they judiciously held back, so you can only hope their resolve doesn’t weaken and find them reverting back to what’s expected at the expense of everything they’ve built up so far. So of course they do. It’s not that Ricks arrival in the forefront can’t be effective, we know full well it can be absolutely riveting when done right, but it’s just that when he does make his solo appearance here it’s far too soon in the proceedings, as following the next verse he repeats Puzey’s entire plea verbatim in the second stanza. Not only does this detract from the heartfelt earnestness of Puzey’s declarations of love, after all, those identical feelings coming from two different people make those sentiments seem somewhat disingenuous, but musically it doesn’t fit either, it doesn’t advance the story forward any, a story we’re fully hooked on finding out what will happen to Puzey. In other words it’s just redundant. Ricks works far better in these settings when he’s the contrasting voice, not a substitute lead, especially when we just heard the same refrain, the same melody, the same everything coming from Puzey with whom we’d built an emotional connection with, buying into his sincerity from the start. Now coming from Ricks it just sounds artificial. His presence isn’t ADDING anything, he’s simply echoing what was already so artfully laid out and in the process detracting from it. Even the wordless backing now gets shaky, as if the rest of them know there’s nothing they can do to add to this part, it’s essentially a solo turn that forces them to step awkwardly aside. It’s clumsy and unnecessary and though you can see it coming it still causes you to cringe. But that’s not to say all is lost, far from it actually. For only during that initial Ricks appearance does it drag down the song’s momentum, but mercifully they recover and only get stronger going forward. From then on, when they’re each given something different to do, the record sparkles again. In fact the most telling moment for how judiciously they mapped the rest of the song out comes when Ricks returns to the forefront for a second solo, one much more organic because now his lines are original, his resonant voice now acting as an anchor, shifting the mood and offering a different, more lecherous, perspective. That unexpected stanza works wonders and pulls the whole song together. To start with it just fits his persona better. Here he’s cast as the badass again, the deep-voiced lothario making his confident move on the girl that the more timid Zeke has eyes for, so those words coming from that voice are no longer out of place, but rather they’re ideal. Ricks essentially is allowed to serve as the more worldly and successful ladies man vying with the pleading hopelessly romantic lines Puzey conveys, giving it added tension along with the added sonic texture they made their living on. Contrast – maybe the most underrated of words when discussing musical arrangements – has been restored. Thanks to that they’re back in the pocket, everything is balanced out again. With Puzey handling the lead for most of the final minute (though Marshall takes the final lines to act as a dramatic capper to the proceedings), they wrap the story up lyrically with aplomb, delivering the meaning of the rather unique title in perfect fashion. Be I Bumblebee Or Not is beautifully sung, cleverly written and, for the most part anyway, save that one unfortunate reach early on with Ricks, exquisitely arranged. 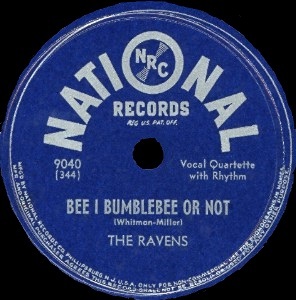 On the whole it’s one of the strongest songs in every conceivable way that we’ve encountered through the first four months of rock ‘n’ roll and it solidifies The Ravens’ spot at the forefront of the music heading into 1948. So yeah, it’s safe to say it’s still gonna earn a big green number, and deservedly so, but it cost itself a little with a misstep that you might’ve seen coming, one you certainly would’ve expected from another group trying to keep their selling point front and center, but one you thought, you HOPED, that they would sidestep entirely. Excise those 27 seconds from the 1:04 mark to 1:31, let Ricks come in after the group bridge that follows that section instead and you’d have had a much tighter record, showcasing far more dynamic interplay with no let up in the tension it was building, and dare I say you might just have had utter perfection. It’s pretty close anyway, and should there be a forthcoming remix it would battle for a ★ 10 ★, but ultimately it falls short due to briefly stepping into a trap that would doom so many others down the road. The suspense for that first jackpot here continues. Leave a reply on "The Ravens: “Be I Bumblebee Or Not”"